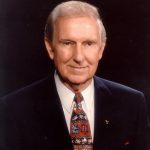 Dr. Hough was a man of vision and possessed a pioneering spirit. He was able to see the future of what our research could accomplish. In the later years of his life, he was able to witness one of the greatest breakthroughs in hearing research – the beginnings of regrowth of the inner ear hair cells. It was a moment of true excitement for Dr. Hough and the entire Hough Ear Institute (HEI) team. and an antioxidant pill that protects people from hearing loss during loud noise exposure. HEI researchers continue to lead the trend in finding a treatment for treating and preventing hearing loss. In fact, in 2017 HEI was the only recipient out of 73 applicants to receive a grant from the U.S. Department of Defense for our research on hair cell regeneration. 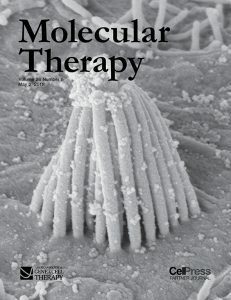 And even more recently, our team’s hard work has been highlighted on the cover of “Molecular Therapy,” a scientific journal. You can think of it as the Rolling Stone of science. This is an exciting and critical time in our history, and you are the reason for our success. Whether you have a relative whose communication has deteriorated, or you wrestle with tinnitus or understanding conversations in noisy restaurants – there’s hope ahead. You are invited take part in this journey toward groundbreaking treatments. One of our generous donors has recently challenged us to raise $300,000. Once we raise this money, we will receive a matching gift of another $300,000! I’m sure you can imagine what an additional $600,000 would do for our research efforts to restore hearing. If you’ve never yet donated to HEI or have been waiting for the right time to give, let us assure you that this is your moment. This match is extended to all new donors or those who have not given in the past two years. And if that doesn’t apply to you – don’t let that stop you from sending a gift or sharing our mission with someone who would love to hear and support our research. Every dollar moves us closer to a treatment that affects hundreds of millions of people worldwide. Who do you know that your gift will help? If you would like more information on how to donate, want more details on this match offer, or want to get to know our team and how we put your money to work in the labs, please reach out to our Director of Development, Justin De Moss via email at justin.demoss@houghear.org. He is eager to meet you and help you make sense of how best to give. Whether it’s stock, corn, cash, or something in between, Justin can help make your giving process easy and give you the peace of mind that your gift is advancing the future of hearing health. Again, thank you for your continued support of our vision and work. It is for you and because of you that we are working so hard on these new advances toward better hearing for all who desire it.